Yummy, healthy, and easy to make! 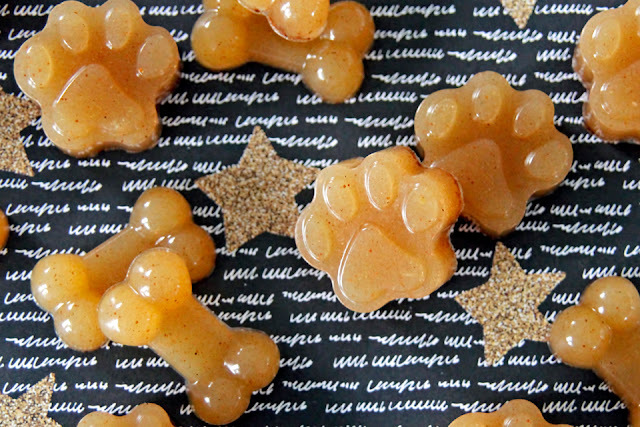 These spiced apple gummy dog treats are quick and delicious. 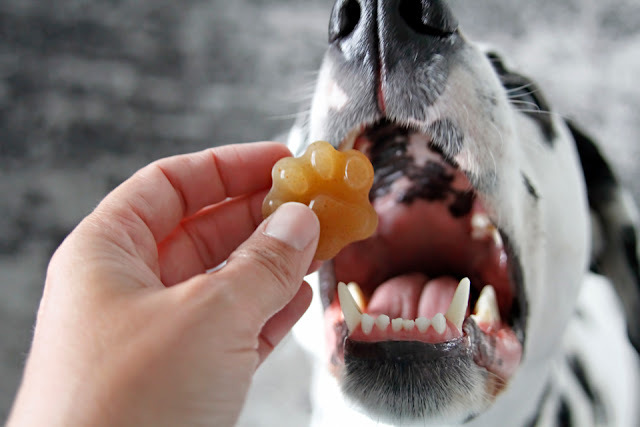 Like most gummy treats, they're low guilt at our place where the dogs absolutely love their gummy treats and we love that they are getting the health benefits of quality gelatin (I typically use Great Lakes beef gelatin) in sneaky "treat" form. Optional: Sprinkle of ground ginger and/or Ceylon cinnamon. I used around 1/2 tsp of each. 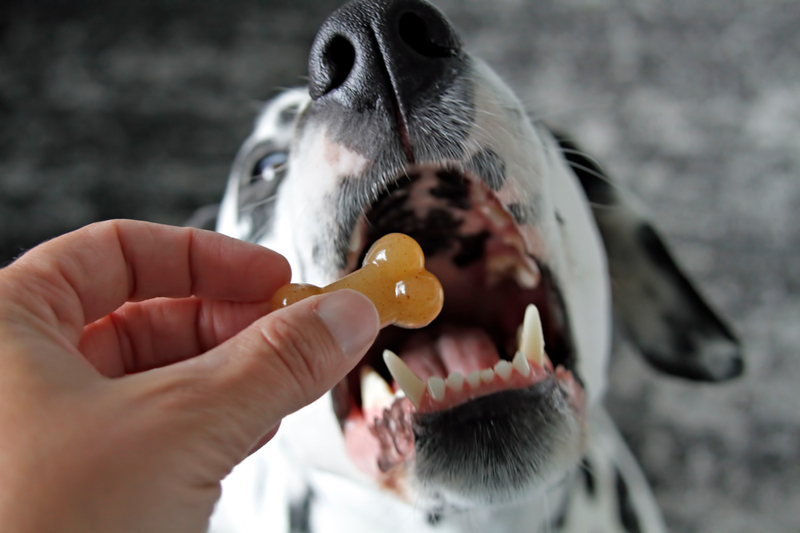 You can use more or less of the spices/seasonings if you wish to alter the supplementation content or smell/taste of the gummies, or something omit completely to better suit your dog. Measure the water into a small saucepan. Sprinkle the surface with gelatin powder and let sit for approximately five minutes or longer for the gelatin powder to bloom/gel. Once your gelatin is bloomed and ready, gently stir the bloomed gelatin mixture over low heat until the gelatin is completely dissolved. Remove from heat, and mix in the applesauce and (optional) spices. Pour/spoon into silicone molds (shaped gummies) or a glass pan (cut and slice). Chill to set thoroughly. Volumes are very easily scaled. If you want a precise measure of a specific pan/mold capacity, you can do a test pour from a measuring cup of water to measure the volume required to fill and scale your added gelatin powder to suit the volume of liquid for your batch of treats. In my experience, 3 tbsp of gelatin powder per cup of liquid makes firm gummies, but if you prefer, you can use more gelatin for added supplementation or less for a jigglier jelly treat with lower gelatin content. Individual gelatin powders may be a little stronger/weaker. Find a ratio that works for your preferences and, of course, your dog. 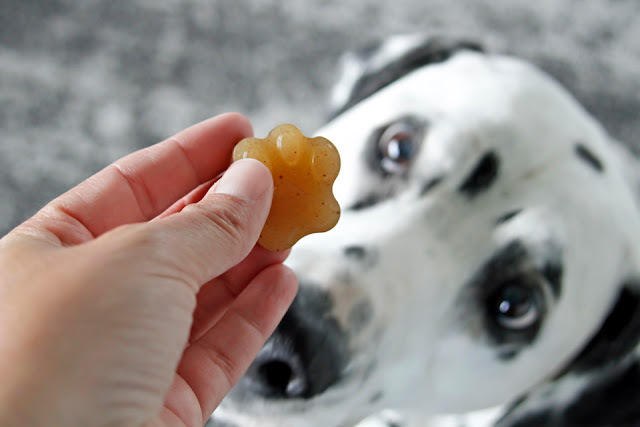 In addition to being doggone delicious and fragrant, cinnamon offers some great health benefits to dogs (and people); however, it's not suitable for everyone. Pregnant/nursing dogs in particular should not be given cinnamon. Ceylon cinnamon is the recommended variety for dogs, if/when used. Hehe - scale to suit your pup indeed! :) I have a mini heart mold that was just too cute to resist using to make little red beetroot gummy hearts and they were so tiny tiny for my boys' giant mouths. Hehe. Fridge storage time will vary with ingredients, dryness, and fridge temperature but no problem at all for several days. We've never had any go off, but I also prefer to err on the side of caution and treat our dog food/treats the same way as we would human food. If a batch was large enough to last longer than a week, I always freeze but generally I prefer to keep the batches small enough so I don't need to freeze gummies. Baked treats I almost always freeze and like to keep a mixed variety of goodies for defrosting in small numbers.